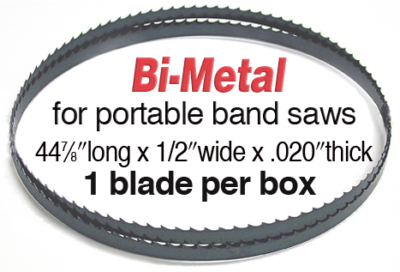 Olson now offers blades for portable Band Saws in 2 different lengths: 44-7/8-in. and 32-7/8-in. These Bi-Metal Matrix blades with Regular or Variable Pitch Teeth have a high speed matrix cutting edge, electron beam welded to a low alloy shock resistant back and resist heat in excess of 1000 degrees F. They cut faster, last 10 times longer than carbon flex back or hard back and have excellent shock and abrasion resistance. 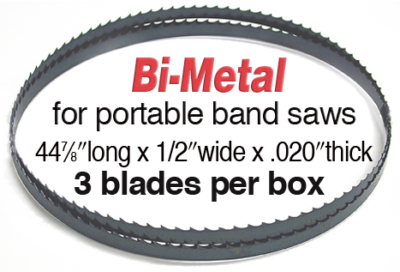 Use Olson’s Bi-Metal Matrix Portable Band Saw Blades to cut a wide range of materials using portable band saws such as Dewalt, Milwaukee, Makita, Black & Decker, Porter Cable, Stout or others that use either 32-7/8-in. long or 44-7/8in. long. These 1/2in. wide blades are .020 inches in thickness and are available either 1 or 3 to a box. We recommend the 3 pack because these saws are perfect for cutting metal on-site, overhead and in tight spaces, but they put a lot of stress on shorter blades. Bi-Metal 32-7/8in. long x 1/2in. wide x .020in. thick. 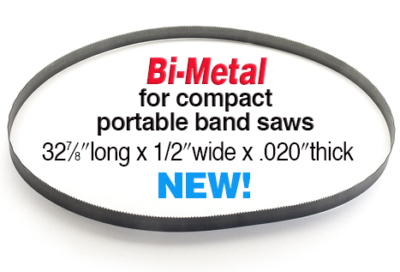 Fits compact portable band saws such as Dewalt, Makita, and Stout that use 32-7/8in. long x 1/2in. wide blades. These Bi-Metal Matrix blades with Variable Pitch Teeth have a high speed matrix cutting edge, electron beam welded to a low alloy shock resistant back and resist heat in excess of 1000 degrees F. They cut faster, last 10 times longer than carbon flex back or hard back and have excellent shock and abrasion resistance. Variable Pitch Teeth vary in size, set and gullet depth which brings teeth into the work at constantly changing angles for fast, smooth and quiet cutting. The varying gullet sizes allow increased protection against tooth strippage when cutting on a wide range of materials and/or dimensions.